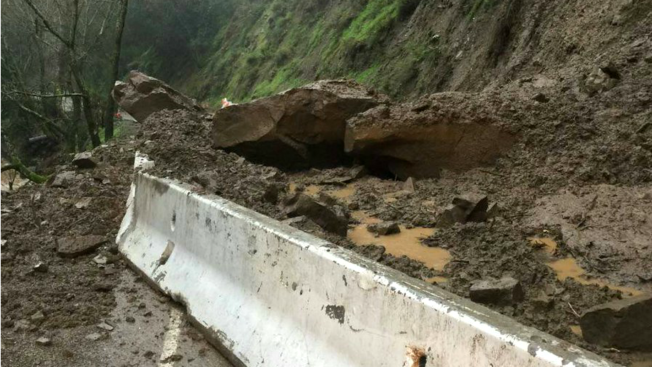 Some highly traveled roads that were closed due to weather impacts in Alameda County have reopened Wednesday, but cleanup from the heavy rains continues, a county public works official said. Altamont Pass Road north of Interstate Highway 580 in eastern Alameda County is open following localized flooding Wednesday, John Medlock Jr., deputy director of the county's maintenance and operations department, said. But Palomares Road remains closed to all traffic between Palo Verde Road in the community of Castro Valley and Niles Canyon Road in Fremont. A mudslide at mile marker 8.73 has made the road impassable. Residents can access their homes from either Palo Verde Road or Niles Canyon Road but other motorists, pedestrians and bicyclists are being asked to use other routes, according to public works officials. Tesla Road is also closed to through traffic between Cross Road in Livermore and Coral Hollow Road on the San Joaquin County line because of a washout near Ruess Road. But on Wednesday morning, crews were out devising a quick repair, Medlock said. He couldn't say how long the repairs will take and the road could be closed again if more rain falls. Also, travel on Koopman Road at mile marker 0.23 in the community of Sunol is limited to one lane because of a mudslide. Public works officials are encouraging people to use caution if they need to use the road. Two parks in the East Bay Regional Park District are closed following the recent rains, park district spokeswoman Isa Polt-Jones said. Del Valle Regional Park is closed through Monday because the park flooded and there's cleanup to do. The park is designed to flood during excessive rain to prevent flooding downstream of Lake Del Valle. Sunol Regional Wilderness is also closed because a rockslide has closed the entry road to the park.